Cook pasta following directions on packet. Drain and reserve 1/3 cup of the water. Return pasta to pot. Meanwhile make pesto. Place thawed peas, basil, ricotta, lemon juice and pine nuts in a food processor and blend until smooth, adding a little hot water if needed. Heat oil and garlic in frypan on high heat. Cook prawns, stirring 2-3 minutes until pink and cooked through. Add reserved pasta water, pesto and prawns to the pasta and toss to combine. Serve with salad or rocket and lemon wedges. 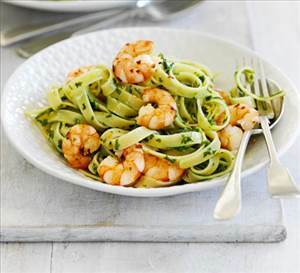 There are 577 calories in 1 serving of Prawn Pasta with Pea Pesto. Calorie Breakdown: 20% fat, 51% carbs, 29% prot.